Sandy Hook Elementary School is one of those tragic incidents that stands out from all the others. It was a break with past shooting horrors, even including Columbine, and caught the nation’s attention because 20 students and 6 adults were killed in an elementary school class by a gunman armed with a semi-automatic AR-15 assault rifle made by Bushmaster and pistols made by Glock and Sig Sauer. 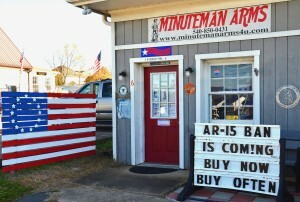 Among the items one can order from Workman’s gun shop is a 30-round semi-automatic Bushmaster AR-15. Five years ago, when Sandy Hook occurred, it was the deadliest primary or secondary school shooting, the second deadliest shooting by a single person and one of the 25 deadliest mass shootings in our history. Still, despite the concern about these deadly weapons, the bill was was defeated in April 2013, by a vote in the Senate with 40 for the ban and 60 in opposition. 19 types of military-style assault weapons were banned in 1994. Congress failed to reauthorize the ban after the ban expired. It wasn’t revived by Senator Feinstein’s efforts or by anyone else’s since. 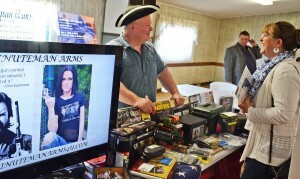 Many believe the time is now when a ban against assault rifles should pass. Thus, the reference in Warner’s sign to that desire. But, in truth, few give a ban much hope of passage in this or perhaps any Congress in the near future despite the nation’s increased tempo of mass killings. The bottom line, the sign’s assertion aside, is that it is highly unlikely that there will be a ban. Of course, if there ever is a ban, it makes no sense to simply grandfather ownership of these AR-15 assault rifles. The ban would likely cover not just prospective sales but also the possession of an assault rifle. 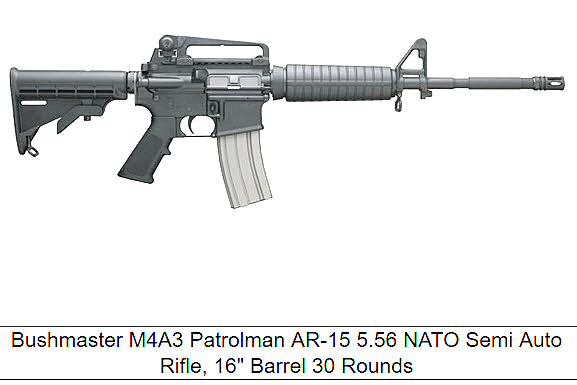 Use of words like “assault rifles” and showing an M4 model AR, illegal nationwide for civilian purchase, as a representative of an AR-15 shows how utterly incompetent and biased the author is. You can write whatever meaningless word salads you want, the constitution clearly states that guns are a right in the United States, and business is business. If you don’t like the humor or sales tactics of the gun crowd, piss off back to your Snuggie and hot cocoa instead of trying to smear and shame people you don’t even know. I’m grateful to still live in a country where freedom still exists. We are all welcome to patronize, or not, any business.. including Mr. Workman’s. Thankfully the approval of others is not necessary to run a lawful company. Just because a few people who have access to someone in the media (who himself has a long history of anti-gun rhetoric and blatant histrionics… like THIS hack piece) don’t like something, doesn’t make his signs controversial. Lastly, assault is an action, not an object. My first point on this is the author’s obvious bias, and that of the people who commented on his Facebook post. In fact, he’s left out the part that when he posted this to Facebook, he also invited everyone to post a bad review of Warner’s business. An open and not-so-subtle invitation to slander a neighbor because you disagree with him. My second point is that contrary to what he and his ilk would have us believe, the second amendment wasn’t created so people could hunt squirrels, rabbits, chipmunk, sparrows, or elephants. The second amendment exists because INDIVIDUALS have an inalienable right to protect themselves with firearms, period. Read the decision in District of Columbia vs. Heller if you don’t believe me. 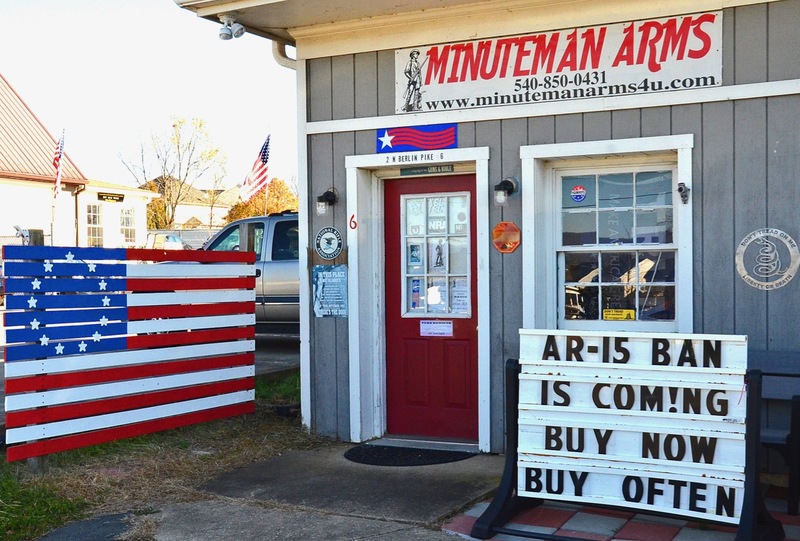 Finally, it doesn’t matter whether John thinks an AR-15 ban is likely or not. It matters whether Warner thinks there could be a ban or not. It’s not John’s sign, it’s Warner’s sign and if he believes it and the sign meets Lovettsville Town requirements for signs, then it’s his first amendment right to voice his opinion. I’ll also call BS on his wishful thinking that if there ever is a ban, that possession of “assault” weapons will be included in the law. Whether he and the other gun grabbers like it or not, there will be no ban that includes confiscation of existing weapons. Any ideas he has that a law like that would be passed and stand a constitutional challenge are wrong. Even the current restrictions on fully automatic weapons, or machine guns, aren’t that draconian. Guns of all types are used far more often to save lives than to take them. That sort of thing just doesn’t make the news most of the time. U.S.A. –-(Ammoland.com)- Kent D. Lindemuth, 65, of Topeka, has been charged with 107 counts of bankruptcy fraud, six counts of money laundering, and one count of perjury. Of the bankruptcy fraud charges, 103 of these allegations have to do with the purchase of firearms. Lindemouth has been in a log running bankruptcy case that has been reported in the press over the last year.